It was a time when your brother persuaded you to eat the grease behind the cooker by telling you it was caramel, your house was blown up by lightning, your dad mixed up the toothpaste and the ‘arse-cream’, and you fell asleep on Sunday nights to the sound of one of the neighbours – who were all named Paddy – drunkenly singing ‘Magic Moments’ in the good front room. All of this while trying to stop your wonky eye from giving the game away. 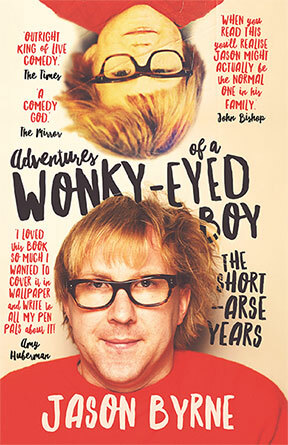 With illustrations by the award-winning Nicky Phelan, Jason Byrne’s Adventures of a Wonky-eyed Boy is a unique memoir capturing the childhood adventures of an accident-prone youngster in suburban Ireland. It’s like Angela’s Ashes on amphetamines!